The blue grass of Kentucky meets the rolling hills of Appalachia at The Historic Boone Tavern Hotel & Restaurant. Our storied hotel in Berea, KY is in its second century of providing guests with the pinnacle of southern hospitality and charm. Our hotel has everything you would expect from an historic property at the Appalachian foothills: tranquility, elegance, replenishment. These things make Boone Tavern an ideal location for your Berea, KY events and meetings. Combine these elements with our attentive events staff and business amenities—high speed WiFi Internet, eco-friendly standards, full-service catering and dining featuring locally sourced food, as well as a location by Berea College—and you have a recipe for a successful event. Our beautifully restored function spaces now include our newly opened Boone Tavern Event Center and total 8,552 square feet across seven separate rooms. With these arrangements, you can plan events for 6 to 150 guests. Boone Tavern events encompass all kinds of gatherings: retreats, board meetings, weddings, conferences, fundraisers, church events, reunions, holiday celebrations, and more. Our staff work closely with you to customize your event precisely. Memorable Package One | $25.95 per person Sit Down Four Course Plated Meal • Iced Tea and Iced Water • Signature Spoon Bread • House Salad • Plated Main Course • Wedding Cake Service • Boone Tavern Signature Coffee Service • Non-Alcoholic Toast of Sparkling Juice • Also Available as Buffet Design Elements • Our professional staff will ensure your personalized decorative elements are placed exactly as you envision. We will place your favors, assist with centerpieces, and use white lighting for the sweetheart table, gift table, and cake table. • Display your slide show on flat screen TVs in the event center. • We work closely with your vendors to ensure perfect timing of the event. • Reserved tables for the guests of your choosing are handled with ease. Memorable Package Two | $29.95 per person Non-Alcoholic Beverage Reception • One Beverage Station • One Cold Hors D'oeuvre display Sit Down Four Course Plated Meal • Iced Tea and Iced Water • Signature Spoon Bread • House Salad • Plated Main Course • Wedding Cake Service • Boone Tavern Signature Coffee Service • Non-Alcoholic Toast of Sparkling Juice • Also Available as Buffet Design Elements • Our professional staff will ensure your personalized decorative elements are placed exactly as you envision. We will place your favors, assist with centerpieces, and use white lighting for the sweetheart table, gift table, and cake table. • Display your slide show on flat screen TVs in the event center. • We work closely with your vendors to ensure perfect timing of the event. • If your vision includes custom linens in your wedding colors, we can assist in coordinating with an outside vendor. • Reserved tables for the guests of your choosing are handled with ease. Memorable Package Three | $34.95 per person Non-Alocholic Beverage Option • One Beverage Station • One Cold Hors D'oeuvre display • Two Hor's D'oeuvres Butler Passed Sit Down Four Course Plated Meal • Iced Tea and Iced Water • Signature Spoon Bread • House Salad • Plated Main Course • Wedding Cake Service • Boone Tavern Signature Coffee Service • Non-Alcoholic Toast of Sparkling Juice • Also Available as Buffet Design Elements • Our professional staff will ensure your personalized decorative elements are placed exactly as you envision. We will place your favors, assist with staging centerpieces, and use beauriful white lighting for the sweetheart table, gift table, and cake table. • Display your slide shows on flat screen TVs in the event center. • We work closely with your vendors to ensure perfect timing of the event. • If your vision includes custom linens in your wedding colors, we can assist in coordinating with an outside vendor. • Reserved tables for the guests of your choosing are handled with ease. Please see attachment for additional information and menu options. 2,214 Sq. Ft. accommodates up to 160 guests banquet style and 120 theater style. The room features original hard wood flooring, large windows for ample natural lighting, built-in banquette eating and crystal chandeliers. 1,520 Sq. Ft. accommodates up to 80 guests banquet style and 100 theater style. The room features state of the art audio visual equipment and a sliding divider wall to create two breakout rooms. 483 Sq. Ft. accommodates up to 16 guests banquet style and 20 guests theater style. The room features large windows for ample natural lighting, fine furnishings for added comfort and two adjoining guest rooms. 380 Sq. Ft. accommodates groups for registration, breaks, and vendor set- up; features a natural gas fireplace, large windows and French doors opening to the porch. 270 Sq. Ft. accommodates up to 14 guests banquet style and 16 theater style. The room features state of the art audio visual equipment, a natural gas fireplace and two walls with beautiful windows. 851 Sq. Ft. accommodates up to 48 guests banquet style and 75 theater style. The room features state of the art audio visual equipment and large original skylights with retractable blinds for natural lighting. 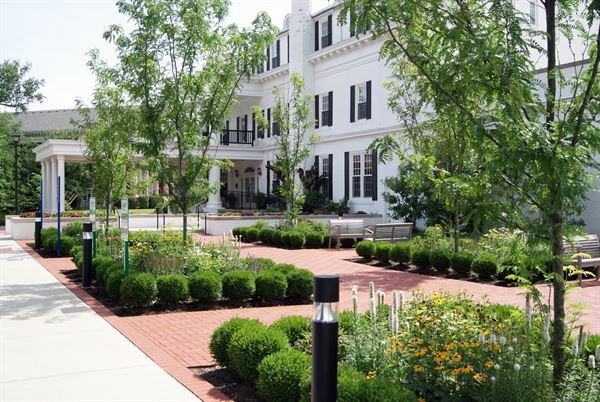 Special Features: Boone Tavern is owned by Berea College, a tuition free college. All students work in exchange for free tuition, room and board.